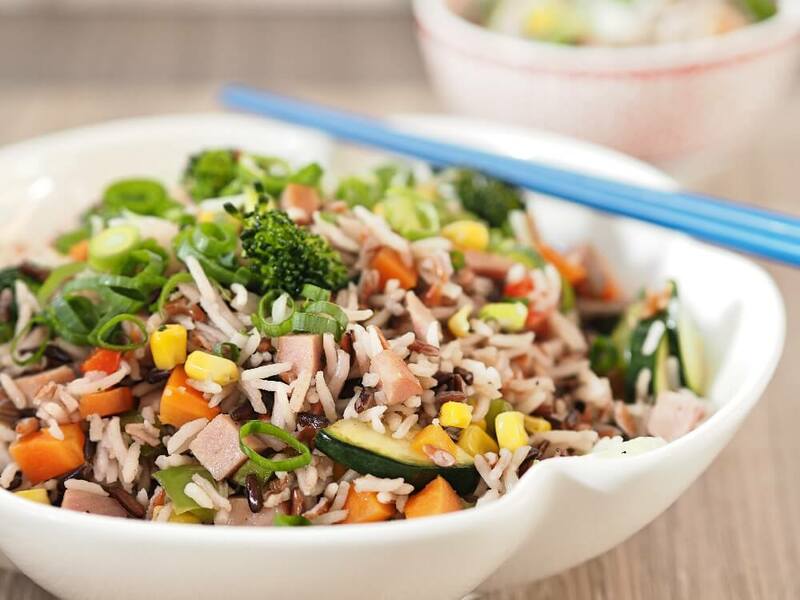 Fried rice goes with a range of dishes, it is super easy, cost-effective and you can make a massive batch to freeze for lunches or another night of the week. It is super versatile as well, making it perfect for the whole family – add in whatever veggies you like, switch up the proteins between ham, prawns, pork or chicken and you have a winner every time. Gotta love that! Note – you don’t have to use different coloured rice, but this is a great way to increase the colour range of your diet. Also, mix things up and try our Cauli Rice option. Place all the rice in your basket and rinse well under cold, running water. Fill the mixing jug with 1 ltr water and place the basket of rice in place. Cook for 15 mins/steaming temp/speed 3, or until just tender. While the rice is cooking, heat a large wok to medium-hot heat, add the oil and cook the veggies for 8-10 mins, stirring occasionally. Add the rice to the wok and stir until hot.